When most people hear about the SHOT Show, the first thing that probably comes to mind is a dreamland of rifles, handguns, and shotguns; but SHOT Show is also a place where some of the top knives manufacturers from around the world go to show off their newest blades that are about to hit the market. 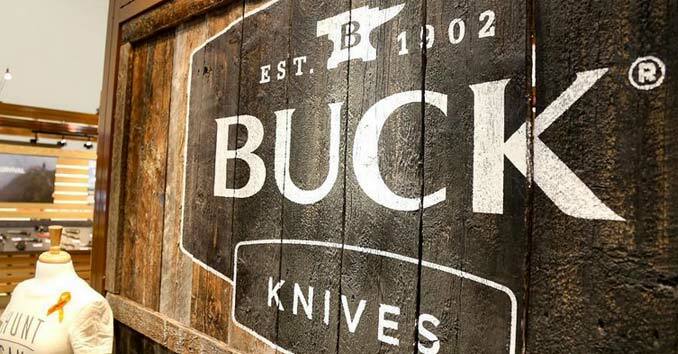 Knives are everywhere during the show, and to kick off our SHOT Show knife coverage, here are some of the newest offerings from Buck Knives. The 110 is probably one of Buck’s most iconic knives; this year they introduced a modern version of their classic with the 110 Auto Elite. The 110 Auto Elite is quickly and easily deployed with the push of a button, revealing the S30V blade. Featuring a G10 handle with nickel silver bolsters, the 110 Auto Elite is sure to be a hit for those passionate 110 fans. The 110 Auto Elite is made in the US and retails for $250. For fans of the 110 Folding hunter knife who are looking for a budget-friendly option, Buck Knives released the 110 Folding Hunter LT. The 110 Folding Hunter LT weighs in at only 3.2 ounces compared to the 7.2 ounces of the original 110 Folding Hunter. The budget-friendly version still uses the same famous blade but replaces the handle with a more affordable lightweight molded nylon. The knife is made here in the US and retails for $38. The Open Season series is a whole line of Buck Knives geared towards hunters. The series features a Skinner, Small Game, Caper, Moose Skinner, Folding Skinner, and Boning knife which covers just about any animal and all game processing. The Open Season Series Small Game Knife is a great little knife for everything from fishing applications to small game. The knife retails for around $75. The 685 BuckLite Max II is another budget-friendly offering from Buck Knives that was introduced at this years SHOT Show. The 685 BuckLite Max II is a heavy-duty, full tang hunting knife. The 2018 version features newly modified handles with ergonomic textured rubber. The knife comes in two different options, a standard drop point blade or guthook. The knife retails for $40. Along with their lineup of hunting and outdoorsmen knives, Buck Knives also introduced a couple of solid EDCs. The 524 Alumni knives feature a 420HC stainless steel blade with an anodized aluminum handle. The nail notch in the blade makes this knife easy to open, while the lockback design locks it open for safety. This small, lightweight pocket knife is the perfect compact knife for your everyday carry. It’s made in the US and retails for only $30. The 366 Rival III is the latest addition to Buck’s Rival EDC knife lineup. The 366 Rival III is the largest of the series and features an ergonomic nylon handle and a 420HC steel blade with Buck’s advanced Edge2x blade technology. The knife retails for $37. Huge fan of the 110, I’ve been carrying one for years. I think I might have to pick up one of the Hunter LTs for when people ask me to borrow my knife out in the field. The hell if I’m going to give them mine and 38 bucks (no pun intended) ain’t bad if something happens or they lose it. I’m hoping buck will offer a drop point blade of the 110 as well, clips are good, but the drop point is (for me) more versatile when butchering big game. The clip’s point will sometimes break during hard use.